You may have noticed that I have not posted much here about coffee of late - which is a shame as there is a lot going on in Perth that deserves to be celebrated and crowed about. It is not for want of coffee either - I have been privileged over the last two months to try some extraordinary coffees in local cafes from a variety of origins and roasters. I have however been quite overworked and have arrived home with little energy for the internet in general. April will still be busy but I also want to make a determined effort to reconnect with some of the cafes I have been to in the past and also visit some new ones with my camera and try and show them in all there glory. I also turn 40 in April - I'm not sure what that means or even what I should do to celebrate it as I am somewhat introverted and not very good and social events. Still I should probably mark it in some way and I think coffee should have something to do with it as the people associated with coffee in Perth have had a profound influence on me over the last decade. Which brings up the other milestone - 10 years in Western Australia, and really, 10 years since I first really became interested in what makes one coffee taste better than another and started this whole rolling journey through the land of the bean. So - resolutions for April: write more about coffee, redesign the writing space, visit cafes (including ones like Zekka, Vinyl, Cafe 54 and Tiger Tiger that I have not been to for a while) and most of all start getting around to some of the great new cafes that have opened over the last 6 month or so as there are some real gems in Perth right now. So G'day, my name is Grendel and I love coffee. 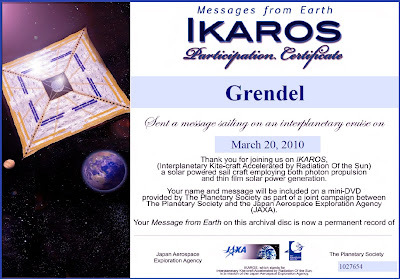 If you want you name to be included on the upcoming launch of IKAROS, you might want to hurry up as the deadline is March 22, 2010. One of the fun things at any barista competition are the amazing signature drinks that the competitors create during their 15 shot at coffee glory. Some with quite bizarre ingredients appear - to great acclaim, or not but either way the creativity that goes into the planning and execution of the signature drinks is a testament to the passion of each barista. I have on occasion been fortunate to try some of these signature drinks and get a lot of inspiration from them. Recently I have been playing with some ideas for signature drinks. 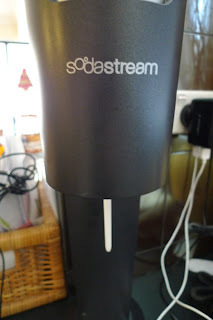 One involves the Soda Stream - a simple device for carbonating water and so far I have made an espresso spider, carbonated iced coffee and a carbonated espresso soft drink. Only the espresso spider seemed to have potential for real greatness - but possibly at someone elses hands rather than my own. My other discovery is Sasparilla. 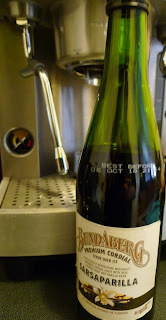 Those who hail from Queensland will recall "Sars" as a familiar drink and while it is not so popular over here in the West you can by the Sasparilla concentrate from Bundaberg. This is a naturally brewed concentrate of ginger root, licorice root molasses and sasparilla root and is absolutely outstanding with espresso. I started by adding about 2ml to the bottom of my shot glass then pouring the espresso over the top. The licorice root gives the drink a not-quite-but-almost salty edge and the result is a sweet and savory concoction of dark power. My next addition was some unsweetened West African Red Cocoa (from CoffeeSnobs) stirred with a little hot water and 2 ml of sasparilla cordial. Into this I poured one shot of espresso and and tipped the lot over vanilla ice cream. I think the trick is the balance of flavour already in the cordial - there is no dominant flavour (just as well as I do not like licorice at all!) but the combination goes with coffee in much the same way that chicory root does. The really good part was that the cordial did not dominate the espresso but elevated certain parts of the flavour profile. This was a fun and tasty experiment!